Sandwiched between Rockefeller Chapel and Frank Lloyd Wright’s Robie House, the GSB’s new Hyde Park home had to be both state-of-the-art and harmonious with its surroundings. How did noted architect Rafael Viñoly solve the design problem? 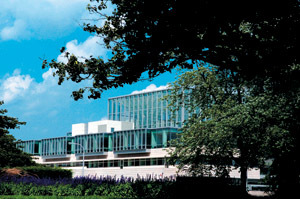 When architect Rafael Viñoly set out to create the Chicago Graduate School of Business Hyde Park Center he faced a laundry list of requirements. The facility had to reflect the latest trends in teaching and student collaboration. That meant high-tech classrooms and meeting areas where group work could thrive. Logistical plans called for a parking garage and plenty of eating and recruiting space—features that the GSB’s old home, spread among five buildings on the University’s main campus, lacked. But the center’s nuts and bolts were only part of Viñoly’s challenge. Its 5807 South Woodlawn Avenue location placed it south of Frank Lloyd Wright’s Frederick C. Robie House and east of Rockefeller Memorial Chapel, two architectural landmarks. The newcomer was expected to fit in. Complicating matters, Robie House reflects the low, horizontal Prairie style, Rockefeller the Gothic preference for high ceilings and soaring arches. Viñoly had to look back to move the project forward. Nearly two-and-a-half years after breaking ground, his answer to the problem is on display, opened in time for fall quarter’s September start. With the 415,000-square-foot building, Viñoly seems to have struck a balance. For $125 million the GSB got its state-of-the-art facility, and the neighborhood got an addition that gives different schools of architecture—and thought—room to coexist. Like a tiered wedding cake, the center’s seven stories are set back in succession, with two placed underground, to reduce the structure’s perceived size. “The massing was considered with that of the surrounding buildings of the campus and the neighborhood,” Viñoly says. 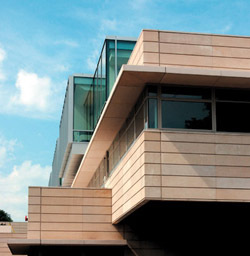 The linear limestone and cantilevered floors were selected with Robie House in mind. In another nod to Wright’s 1910 masterpiece, the entranceway terrace provides a view of its northerly influence. Not to give Robie House too much play, the center’s winter garden, as Viñoly coined the open, plant-filled space, takes Rockefeller as its inspiration. 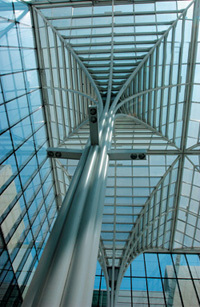 The 83-foot-tall, glass-enclosed atrium’s steel columns extend the building’s height, mirroring the chapel’s lancet windows. Curved beams form arches in yet another Gothic bent. Stylistic concerns aside, a pragmatic thread runs through the center’s design. Features such as a food-service area, group-study rooms, wireless Internet access, a computer lab, lockers configured to hold interview suits sans wrinkling, and a lounge complete with pool tables aim to make mingling and spending a full day there—as many of the approximately 1,600 full-time students and staff do—easier. To further encourage idea sharing, faculty offices are arranged so that professors from different fields, say finance and marketing, work side by side.—M.L.